VANCOUVER - Fields of hemp might become a late-season pollen bonanza for bees. 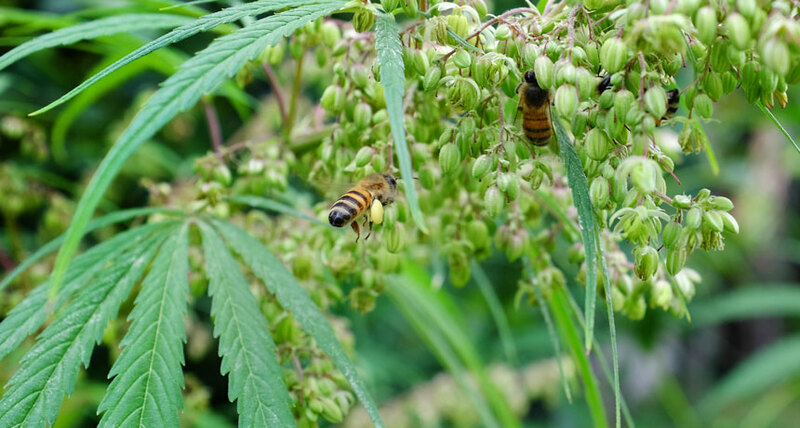 Industrial hemp plants, the no-high varieties of cannabis, are becoming a more familiar sight for American bees as states create pilot programs for legal growing. Neither hemp nor the other strains of the Cannabis sativa species grown for recreational or medicinal uses offer insects any nectar, and all rely on wind to spread pollen. Still, a wide variety of bees showed up in two experimental hemp plots during a one-month trapping survey by entomology student Colton O'Brien of Colorado State University in Fort Collins. Bees in 23 out of the 66 genera known to live in Colorado tumbled into O'Brien's traps, he reported November 11 at Entomology 18, the annual meeting of the U.S. and two Canadian entomological societies. O'Brien and his adviser, Arathi Seshadri, think this is the first survey of bees in cannabis fields. "You walk through fields and you hear buzzing everywhere," O'Brien said. He caught big bumblebees, tiny metallic-green sweat bees and many others clambering around in the abundant greenish-yellow pollen shed by the male flowers. Bees need pollen to feed their young, and during the trap survey in August 2016, there weren't a lot of other flowers blooming. Hardly anything is known about the nutritional qualities of hemp pollen for larval bees. Yet, commercial hemp plots may end up as rare food sources for pollinators in stressful times, O'Brien said. Honeybee health has faltered in recent years, and conservationists also worry about the fates of the many, less-studied wild bees. O'Brien urged crop scientists now developing the pest fighting strategies for outdoor hemp to be mindful of bee health. Pest management techniques for hemp are still a work in progress. There are even questions about which insects are truly hemp pests, said entomologist Whitney Cranshaw, also of Colorado State. New potential menaces have arrived since the early 20th century, when farmers were growing hemp with very low concentrations of the psychoactive compound THC as a crop for fiber and other practical uses. Anti-drug legislation eventually made growing any cannabis forms illegal for decades in the United States. The 2014 U.S. Farm Bill, however, differentiated between hemp with less than 0.3 percent THC by dry weight, and high-THC cannabis varieties of interest for recreational and medical use. This distinction has allowed states such as Colorado and Kentucky to set up programs for regulated legal growing in a push to revive the potentially valuable crop. But there are a lot of new questions about old plants.